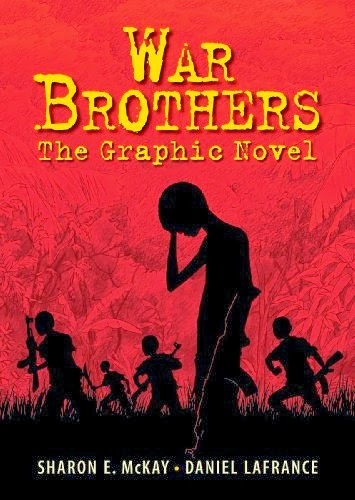 After reading the graphic novel War Brothers, I realized that I’ve never really experienced hardship in my life. The most harrowing moment I’ve experienced lately is seeing the “Temporarily Out of Stock” message on Amazon when trying to buy a pair of slippers. War Brothers is a nightmare on paper. What’s even more troubling is the fact that it’s entirely true. It takes the reader on an exploration of unspeakable violence, torture and the limits that people will go to survive. The year is 2002, Jacob is a 14 year old boy from a wealthy family, living in the Ugandan city of Gulu. Life is good and Jacob is looking forward to returning to school and catching up with his friends. On the periphery of this setting is the now-infamous Joseph Kony and his group The Lord’s Resistance Army (LRA), who are abducting children, forcing them to fight for his cause or be murdered themselves. His cause being the complete destruction of the Ugandan government and everything it stands for. When Jacob and his friends arrive at school they discover that everything is in lockdown and the grounds are patrolled by machine gun wielding soldiers. This is a percaution against Kony and the LRA, the children are told. Unfortunately the minute the LRA arrives in the middle of the night, the soldiers flee. The teachers are slaughtered and Jacob and his friends are abducted. They are taken into the jungle, starved, beaten, tortured and driven to madness by other soldiers who amazingly appear to be even younger than them. The questions this book poses are: What would you do to survive? How far would you go and how much do you think you could take? The War Brothers graphic novel is based on Sharon E. Mckay’s novel of the same name, and is worth checking out as well as it is based on a massive amount of research and interviews with child soldiers and their families. Lafrance’s beautiful artwork echoes the emotional state of the book, primarily fear, horror and outright panic, but it never delves too far into the bloodshed. Most of it is implied, which gives it an even stronger punch. In the 45 minutes it took me to read I felt like I was getting repeatedly pummeled to the guts by with a battering ram. War Brothers is not an easy book to read, but it is an important book. It opens with a letter from Jacob in which he warns the reader of the content and says “There is no shame in closing this book now.” Please don’t. Read it, and then find someone to recommend it to. Labels: Graphic Novel , Real Lives , Survival , War - What Is It Good For? Thank you for bringing this book to light. I will suggest it to out Teen Services Librarian! The most horrifying fact about this book is that it's not fiction.